Here at YOUR ANDALUSIA, we take your idea of a dream Tour Holiday in Southern Spain and help you turn that into a reality. We will make suggestions that will enable you to get the maximum out of the time that you have to spend here in Andalusia. Our Tours are personalised and our experience lets us know what is important to clients, whether they be individual travellers, a couple, a family or an extended group of friends. We at YOUR ANDALUSIA offer a variety of chauffeur driven Cultural Tours to suit all tastes; from our Day Trip Tours visiting Andalusian cities to our 5 star Private Tour Packages, staying of course, in 5 star hotels. You may be interested to know however that our most popular Tours are undoubtedly our 5 and 7 day Villa Based Holidays, quite simply because they offer our clients everything !!! 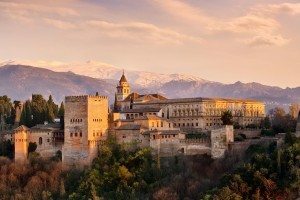 On these Tours you will have the opportunity to spend a day in each of the cities of Granada, Seville, Cordoba, Malaga and Ronda and of course to visit all the World Heritage sites and wonders that these cities have to offer, (The Alhambra, The Mezquita and The Royal Alcazar to name but a few). In the evenings you will be able to enjoy the ‘real’ Andalusian way of life at your private luxury villa or in the restaurants and tapas bars of our traditional Andalusian town. AND WHEN WE TELL YOU THAT THIS STYLE OF TOUR HOLIDAY STARTS FROM JUST €625 FOR A 5 DAY TOUR, YOU WILL UNDERSTAND WHY THEY ARE SO POPULAR!! Click on our drop down menu in this page to learn more about all of the Tours/Holidays that we have to offer, or indeed scroll down this page, where below you will find examples of a short four night, City Based Tour and a longer 6 night, Cultural Andalusia Tour. The important thing to remember however is the flexibility which our company can offer, so should these formats not suit your requirements exactly, please let us know and we will do everything possible to provide you with the Dream Andalusian Experience that you desire. Day1. We will collect you at Malaga airport on your arrival and time permitting we will start your Andalusian experience with a short stop off in Malaga city centre or a visit to the mountain town of Mijas, one of the most famous Pueblos Blancos, (white towns), in Andalusia. Later we will transport you to your chosen accommodation, aiming to arrive there for around 6pm. Day2. We will collect you after breakfast at 9.30am and head off to visit the Andalusian Capital of Seville where our guide will walk you through the historic centre of the city, explaining the background to the important World Heritage sites such as the 15th century Cathedral, the Royal Alcazar and the General Archive of the Indies, as well as the other iconic sites of this magnificent city. We will aim to finish the walk around 1.30pm, in time for lunch at one of the many wonderful restaurants in the the old Jewish Quarter, (the area known as El Barrio De Santa Cruz), and after lunch you will have time to enter into the Cathedral and the Royal Alcazar or perhaps take a boat trip on the famous river Guadalquivir. We will meet up again at the pre-arranged time and place and head back to your accommodation. Day3. 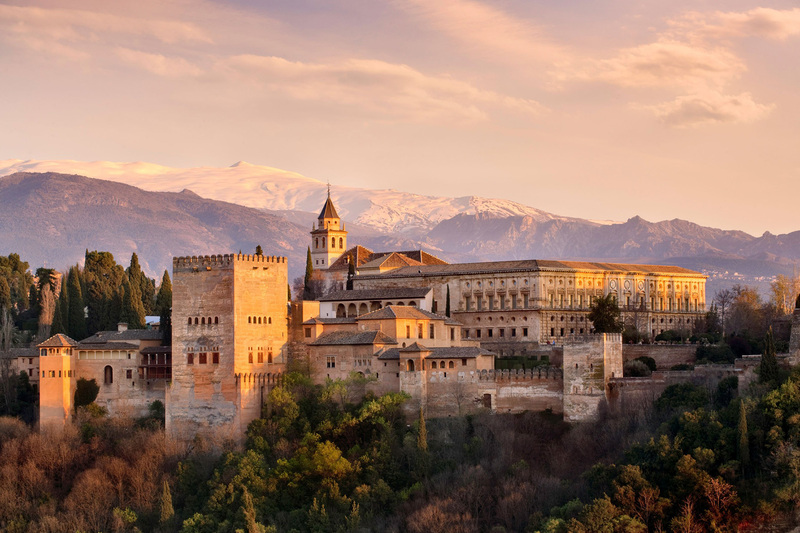 We will collect you after breakfast at 9.30 and head off to visit the city of Granada and the mystical Alhambra, (another World Heritage site), which was the centre of the ancient Moorish kingdom of Granada and the last Moorish stronghold in Spain, until its surrender in 1492. We will park in the historical centre of the city and begin the walking tour where you will have the opportunity to visit the 16th century cathedral and the Royal Chapel and mausoleum of Queen Isabel and King Fernando, Los Reyes Catolicos, who completed the Christian re-conquest of Spain when they accepted the surrender of Granada in 1492. Other notable sites include the Basilica of San Juan De Dios, the Bib-Rambla and the Plaza Nueva. We will completed the city centre tour around 1pm, in time for lunch and at 2pm head off in the vehicle to the Alhambra complex where you will have four hours to soak in the wonders of the fantastic World Heritage site comprising of palaces, gardens and fortresses. You will be met by our guide at 6pm at the exit from the Alhambra and taken back to your accommodation. Day4. We will collect you after breakfast at 9.30am and head off to visit the romantic city of Cordoba, the centre of the Moorish empire of Al-Andalus for more than 300 years. A city that was a beacon of light during the troubled medieval times and where peoples of all faiths and backgrounds lived in harmony. We will park the vehicle fifty metres from the medieval walls of the city and enter into the historic part through the ancient Seville Gate. The jewel in the crown of Cordoba is of course the incredible World Heritage site of the Mezquita, but during our morning walking tour you will have the opportunity to visit other impressive sites such as the 14th century Alcazar of the Christian Monarchs, (infamously used as the headquarters of the Spanish Inquisition from 1482), the Royal Stables, (now the home of the famous Passion and Spirit Andalusian Equestrian Stable), the 14th century Synagogue, (one of only three medieval Synagogues left in Spain) and the early 15th Century Chapel of Saint Bartholomew, built in the Mudejar style. We will arrive at the steps of the Mezquita around 1pm, in time for lunch at one of the many quality and reasonable priced restaurants in the area. After lunch you will have free time to enter into the Mezquita and continue exploring the other highlights of the historic city, such as the Roman Bridge, the Calahorra Tower, the Door of the Bridge, Saint Raphaels Triumph, (a monument to the Patron Saint of Cordoba), the ancient Hospital of Saint Sebastian, the Almodovar Door, (one of the seven ancient entrances to the city), and the Arab Baths. At around 5.30pm we will meet at the pre-arranged point and you will be driven back to your accommodation. Day5. Departure Day. Depending on the timing of your flight, we will stop off at Antequera on our way to Malaga airport. Antequera is a mid size market town with over two dozen religious buildings. We will take time out to have a coffee before visiting the three Dolmens located in the town, (intact Neolithic structures dating from around 5,000 years ago), after which we will continue on our journey to Malaga Airport. Day 2. We will collect you after breakfast at 9.30am and head off to visit the iconic town of Ronda, spectacularly set high above the Guadalevin gorge with the hills of the Serrania de Ronda as its backdrop. Ronda is more than a picture postcard town, it is a place steeped in history, its very name being an adaptation of the name given to the site by the ancient Celts who settled there in the 6th century BC, Arunda. Ronda is also the birthplace of modern day bull fighting and has beguiled many a famous traveler, including Orson Welles and Ernest Hemingway, as well as the famous 20th century German poet, Rainer Maria Rilke, who were all seduced by the beauty and history of this town. Hemingway is said to have been inspired by the famous Puente Nuevo, (New Bridge), in Ronda when writing his account of Spanish Civil War atrocities in his book, For Whom the Bell Tolls. Ronda is the perfect Andaluian town to explore at your own pace and after arriving we will take the short walk to the historic centre of the town where you will be free to visit the museums and sights and choose one of the many quality restaurants to have lunch. We will arrange to meet up again in front off the historic bull ring at a pre-arranged time in the afternoon before heading back to your accommodation. Day 3. We will collect you after breakfast at 9.30am and head off to visit the romantic city of Cordoba, the centre of the Moorish empire of Al-Andalus for more than 300 years. A city that was a beacon of light during the troubled medieval times and where peoples of all faiths and backgrounds lived in harmony. We will park the vehicle fifty metres from the medieval walls of the city and enter into the historic part through the ancient Seville Gate. The jewel in the crown of Cordoba is of course the incredible World Heritage site of the Mezquita, but during our morning walking tour you will have the opportunity to visit other impressive sites such as the 14th century Alcazar of the Christian Monarchs, (infamously used as the headquarters of the Spanish Inquisition from 1482), the Royal Stables, (now the home of the famous Passion and Spirit Andalusian Equestrian Stable), the 14th century Synagogue, (one of only three medieval Synagogues left in Spain) and the early 15th Century Chapel of Saint Bartholomew, built in the Mudejar style. We will arrive at the steps of the Mezquita around 1pm, in time for lunch at one of the many quality and reasonable priced restaurants in the area. After lunch you will have free time to enter into the Mezquita and continue exploring the other highlights of the historic city, such as the Roman Bridge, the Calahorra Tower, the Door of the Bridge, Saint Raphaels Triumph, (a monument to the Patron Saint of Cordoba), the ancient Hospital of Saint Sebastian, the Almodovar Door, (one of the seven ancient entrances to the city), and the Arab Baths. At around 5.30pm we will meet at the pre-arranged point and you will be driven back to your accommodation. Day 4. We will collect you after breakfast at 9.30am and start our visit to some of the natural beauty spots of central Andalusia. First of all we will drive into the El Torcal natural park in the mountains above Antequera. We will drive up to the visitors centre at around 4000 feet above sea level where we can take a short 45 minutes walk amongst the natural stone sculptures formed after millions of years of wind and rain erosion. There you will be able to soak up the tranquility of the area and may have the opportunity to catch a glimpse of the mountain goats and griffin vultures that are often visible during our visits. After our walk we will take a short break in the cafeteria of the visitors centre before heading off to drive through the Guadalteba Natural Park and stop off for a leisurely lunch at a lakeside restaurant. After Lunch we will complete our drive through the park making a couple of stops to take in the wonderful views available in this region, including the famous El Chorro gorge and El Camino del Rey, (the Kings Walkway), before heading back to your accommodation. Day 5. We will collect you after breakfast at 9.30am and head off to visit the Andalusian Capital of Seville where our guide will walk you through the historic centre of the city, explaining the background to the important World Heritage sites such as the 15th century Cathedral, the Royal Alcazar and the General Archive of the Indies, as well as the other iconic sites of this magnificent city. We will aim to finish the walk around 1.30pm, in time for lunch in one of the many wonderful restaurants in the area and after lunch you will have time to enter into the Cathedral and the Royal Alcazar or perhaps take a boat trip on the famous river Guadalquivir. We will meet up again at the pre-arranged time and place and head back to your accommodation. Day 6. We will collect you after breakfast at 9.30 and head off to visit the city of Granada and the mystical Alhambra, (another World Heritage site), which was the centre of the ancient Moorish kingdom of Granada and the last Moorish stronghold in Spain, until its surrender in 1492. We will park in the historical centre of the city and begin the walking tour where you will have the opportunity to visit the 16th century cathedral and the Royal Chapel and mausoleum of Queen Isabel and King Fernando, Los Reyes Catolicos, who completed the Christian re-conquest of Spain when they accepted the surrender of Granada in 1492. Other notable sites include the Basilica of San Juan de Dios, the Bib-Rambla and the Plaza Nueva. We will completed the city centre tour around 1pm, in time for lunch and at 2pm head off in the vehicle to the Alhambra complex where you will have four hours to soak in the wonders of the fantastic site comprising of palaces, gardens and fortresses. You will be met by our guide at 6pm at the exit from the Alhambra and taken back to your accommodation. Day7. Departure Day. Depending on the timing of your flight, we will stop off at Antequera on our way to Malaga airport. Antequera is a mid size market town with over two dozen religious buildings. We will take time out to have a coffee before visiting the three Dolmens located in the town, (intact Neolithic structures dating from around 5,000 years ago), after which we will continue on our journey to Malaga Airport.